Paper circles garland, upcycled vintage book paper garland 10 ft, eco friendly wedding shower decor, printed paper decor for engagement, anniversary. It is Handmade by me. It is great as black & white themed birthday party decoration, wedding decoration, Valentine's day decoration, anniversary, parties, baby shower, bridal shower, housewarming and for everyday cheer. This wedding garland is perfect as vintage wedding decoration, birthday party garland, bedroom or kid's room decor, library or geek's room. You can hang it above your fireplace, on living room walls, across windows or doorway and for outdoor garden party. 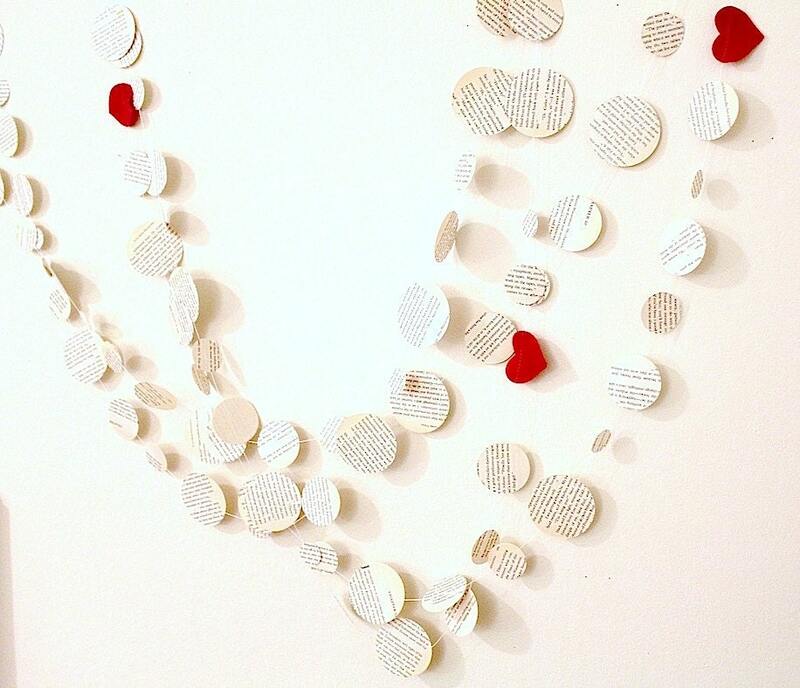 This garland is upcycled from a vintage book which was collected to be made into paper pulp. perfect! exactly what i wanted! Looks very cute and pretty on the cake! The order will be shipped only after the payment is completed and received through Paypal or Credit Card. Please convo me or email me at PaperDotCo at gmail dot com, if you have concerns or questions regarding the product you received. No returns will be accepted without prior arrangement via Email. Some returns will be subject to a 15% restocking fee. I ship all the orders by US First Class Mail and US First Class International Mail. I can ship it by Priority Mail, if you upgrade the shipping fee.